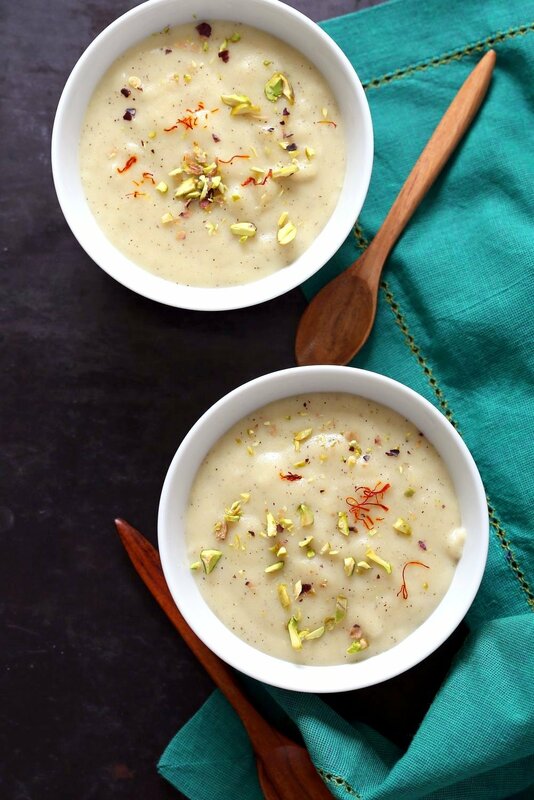 Thandai Phirni – Spiced Rice Flour Pudding for Holi Festival. 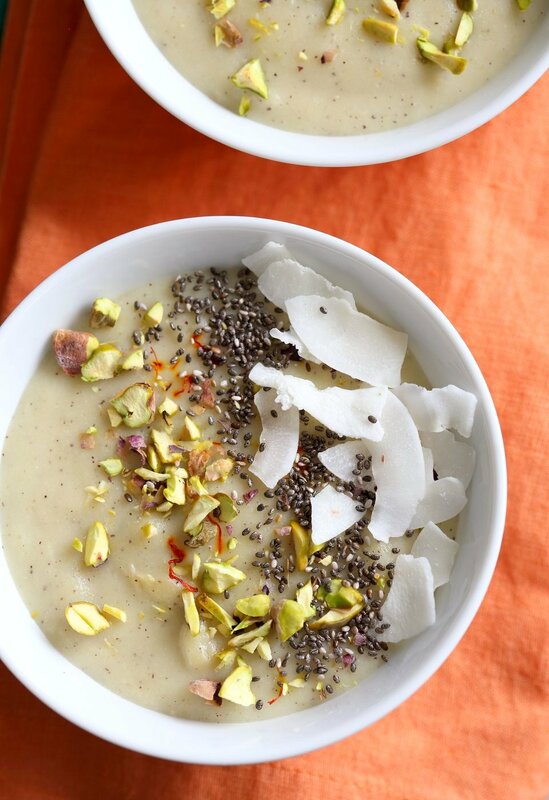 Vegan Phirni Recipe with Thandai Masala mix. Vegan Indian Dessert Gluten-free Soy-free Refined oil free. Happy Holi Everyone! Tis the time for this festival of Colors. Although it is too cold out here to really enjoy it. Ideally a warm day is essential for all the fun with the watered and dry colors. See some pictures of the celebration from last year in India here. Holi, like most other Indian festivals has some specific dishes associated with it. Thandai, which is a nutty refreshing thick milk shake like drink (often also spiked), uses a Thandai blend of nuts and spices. 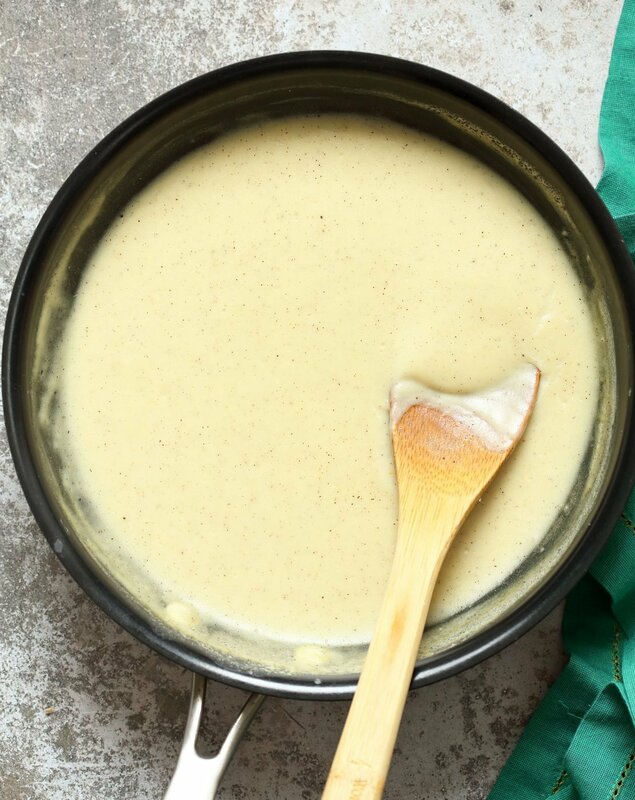 I use that blend to add the flavor to this rice flour pudding called phirni. Phirni is often flavored with just saffron or cardamom and is a simple rice pudding. It is creamy, custard like, melt in the mouth lightly sweet, lightly flavored. Garnish with slivered raw or toasted nuts and dried rose petals for a pretty dessert. To serve it as a snack or breakfast, garnish with chia seeds, other toasted seeds, nuts and coconut. Phirni is generally made with soaked rice, this is a quicker version with rice flour. 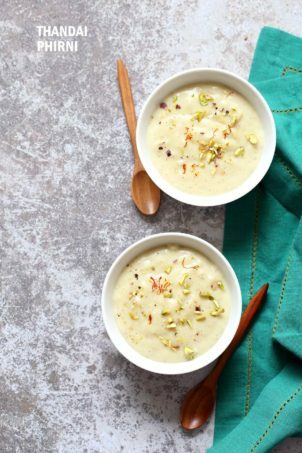 This phirni uses the Thandai masala blend and makes for a delicious, nutty, spiced pudding. You can make this into a simple rice pudding as well, see Recipe notes for options. More Holi Recipes from the blog! Gajar Halwa- Carrot Spoon fudge GF. Savory: Samosas– stuffed pastries , Mathri (spiced Crackers). Thandai Masala Blend above. Use the Thandai blend with 1 cup of non dairy yogurt and 1/2 cup almond milk and some ice cubes and sweetener, blend to make a Thandai Lassi! Add the blend to you regular rice pudding or blend with warm non dairy milk for spiced milk. If you make any of the Holi Dishes, do let me know how they turned out! I love to see the remakes and get feedback about the recipes. Happy Holi to all who are celebrating, stay warm and safe. Use whichever ingredients you have and do try this Delicious Pudding. Thandai Phirni - Spiced Rice Flour Pudding for Holi Festival. 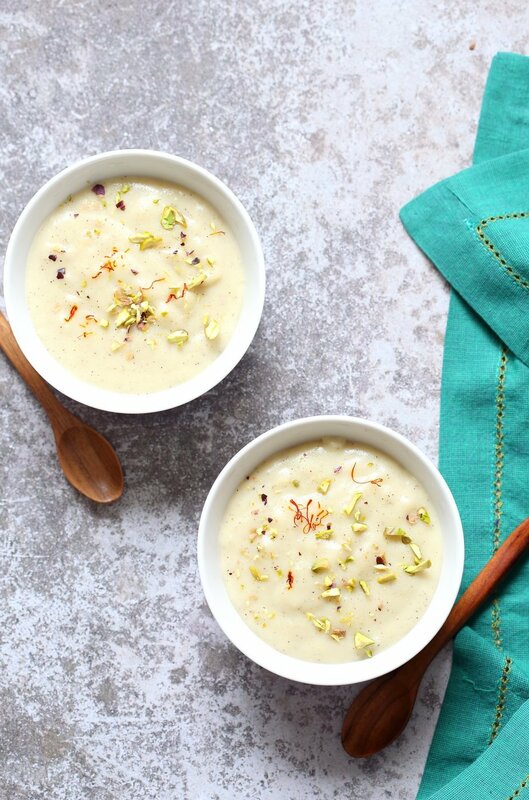 Vegan Phirni Recipe with Thandai Masala mix. Vegan Indian Dessert Gluten-free Soy-free Refined oil free. Serves 4 as a dessert helping. 2 otherwise. 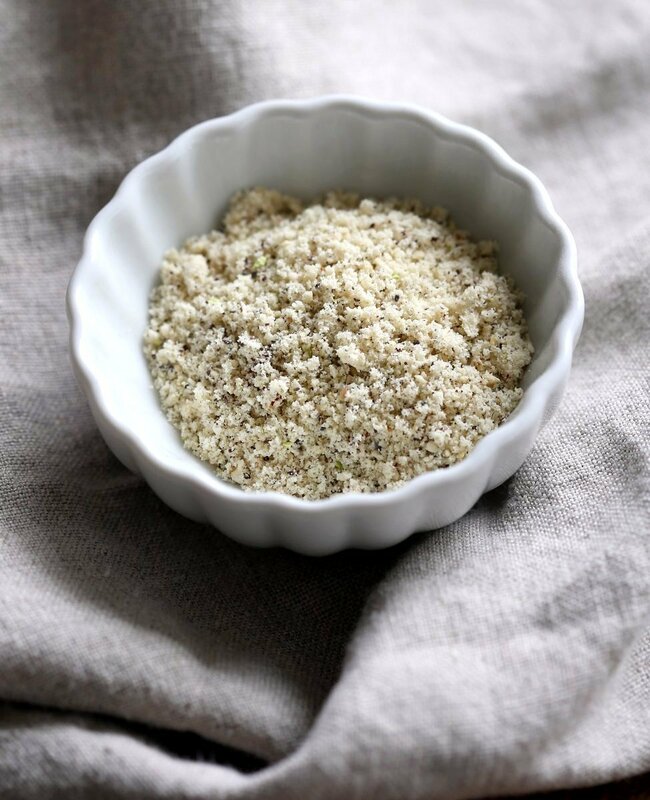 Thandai Blend: Grind the ingredients in a grinder, blender until a coarse mixture. Pudding: Blend the rice flour, 1 cup non dairy milk and the thandai blend. Blend for a minute, then let it rest for a minute, then blend again for a minute. I use the same blender which has the coarse Thandai mix. Add the rice flour thandai mixture to a saucepan over medium heat. Add the rest of the non dairy milk, sugar, salt and mix in. Bring it to a boil. The mixture will start to get lumpy, keep stirring frequently and the lumps will incorporate in the pudding. Once smooth, cook for another minute. Once the mixture is very lumpy, you can reduce the heat to medium low to avoid sticking. It takes 10 - 12 minutes total. For a simple rice pudding without Thandai Mix: Mix the rice flour in 1/2 cup non dairy milk until there are no lumps. Add to a skillet with the rest of the milk, sugar, salt and bring to a boil. Add 1/4 tsp cardamom or saffron or vanilla extract and mix in. Taste and adjust and continue to simmer to thicken for a minute. Variations: Use the Thandai blend with 1 cup of non dairy yogurt and 1/2 cup almond milk and some ice cubes and sweetener, blend to make a Thandai Lassi! Yummy, I’ve only had rice pudding before, and I never heard of rice flour pudding! I love discovering new ethnic recipes that are so creative and flavorful. This is a dish I would love to taste someday! Can I sub brown rice flour for white, or is the taste to strong? In general can you sub brown for white rice flour, like whole wheat and white etc., with only minimal changes in fluffiness at baked goods? Yes, in general you can sub brown rice flour for white rice. sometimes in baking, brown will absorb a bit more moisture, so check the consistency of the mix before baking or add less flour to begin with. Its also a personal preference. I find the taste of brown rice flour a bit too strong and muddy which overshadows the light flavors like these. If you are accustomed to the flavor in general, you might not notice it much. I would say make a ssmall batch to try, make pudding with a 1/2 cup non dairy milk, sweetener, a drop of vanilla and 2 tsp brown rice flour, bring to boil and thicken for 2 mins after that and see how you like the flavor. This recipe could not have come at a better time. I had jaw surgery 2 days ago and I can’t eat anything which requires chewing for at least a two weeks, so I’ll be living on soup and dal. I just made this recipe and I’m so happy I can add something sweet to the list of things I’m allowed to eat. It tasted great, thank you for the recipe! YUMMMMM. I made this with about 5 blended, soaked Deglet Noor dates instead of the sugar, and I didn’t have rice flour, so I ground up some rice. DELICIOUS. Thanks for posting this. I no longer can eat my favorites from the local India Sweets and Spices, ever since I went plant-based. Ohhh this looks so interesting and different. Definitely going to give it a try! yes. you need only a few strands in most recipes, so get a small box.